We say "Who is that Spirit who is hiding there?" When we catch a glimpse of what could easily be overlooked as we walk through a forest. 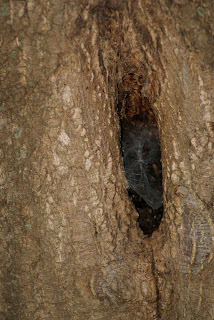 In the above photos you can see a hollow in the tree where a spider has spun a sticky web. 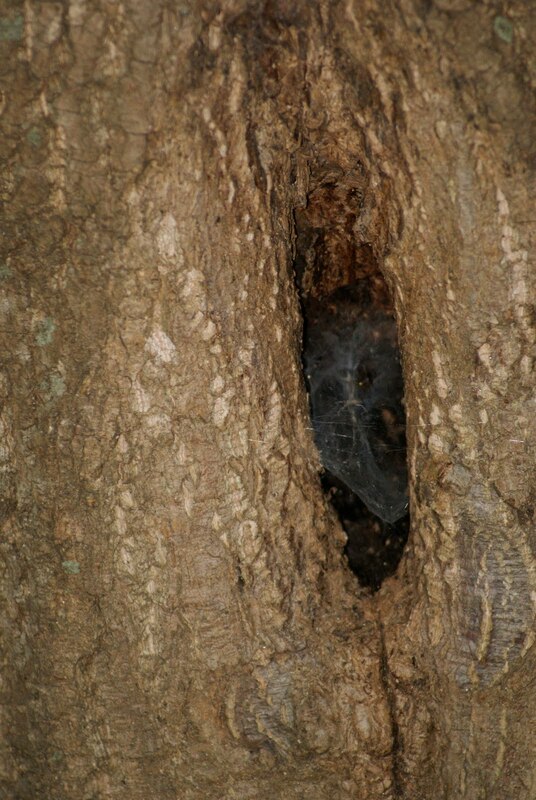 The form of the web together with the tree allows us to see a "spirit" who is "hiding" there. Not only this but a Ngangulero (Brujo) or Ngangulera (Bruja) uses their creative mind and spiritual experience to utilize the hollow and spider web for a variety of potential purposes. There are many commonly overlooked details which the Palera/Palero finds many uses for. This is a tree trunk that had been used to mark a point Ceremonially on one of the Bateys. Part of the Palo had started to decay so we removed it and stacked it for later Ceremonial use. We replaced the dead Palo with a Live Tree which will grow large over the years. 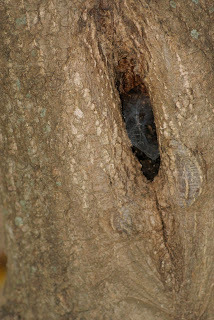 The dead trunk became a haven for Fire Ants who created a Colony within it. There are many wonderful and amazing trees on the Land. There is one which has to be about 150-200 years old which is half hollowed out, enough to be able to sit someone right inside during a process. The young sapling that we planted to replace the trunk is a Black Locust Tree. Black Locust trees bloom beautiful white flowers in the spring which attract the honey bees. Their relatives, which we have also planted everywhere, "Honey Locusts" bloom purple flowers in the spring, again attracting bees. Locust wood is extremely hard and a kind of yellow color. It is superb for fence posts, building Munansos and other uses as it has a natural strength that prevents decay of the wood.